Podcasts have been a big feature of my trip so far. Many long distance bus journeys have been spent listening to Kirsty Young asking various people for the tracks and luxury items they’d need if they were castaway on a desert island (Michael Johnson was a notable running episode) and I’ve pondered what I’d ask for. For the past two days I have found out, having been marooned on a desert island for real. OK, I wasn’t exactly marooned, I slept in a hotel room, had a hot shower and a lot of good food – but it was a sand island (the biggest sand island in the world) and I had no phone signal or wifi so I think that’s pretty much the same thing. 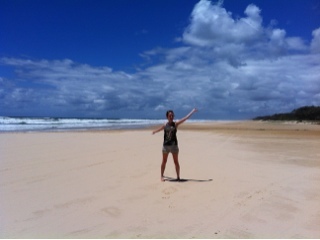 I spent two days on Fraser Island which was realy nice. There, not only did I discover that my luxury item would be a sports bra please Kirsty, but I also realised some of the benefits of running on holiday. My group of 20 set off on a walk through a forest to Lake Wabbie. Wanting to be the first there and to experience this massive sand dune and lake by myself for five minutes I broke into a sprint and passed all of the group. Five minutes alone in these beautiful surroundings was amazing. Fraser Island is also home to 75-mile beach. And if that name alone isn’t crying out for an ultra-marathon to be staged on it, I don’t know where is. Keen to investigate this I seized my opportunity late afternoon when the weather broke to go for a short run. I ran about 500m down the beach before I noticed some dingo footprints. As we’d been told several times not to go to the beach alone because of the dingos, I took this as my cue to turn round and run back. I had no running shoes, so I ran barefoot but I did have a sports bra. The only luxury item I’d need if I was to be marooned there for good. And maybe some sort of dingo repellent too. Beautiful photo, I like the idea of your sports bra being your luxury item – I think that would be a new one for her!